The potential presence of cannabis retail stores in Brampton has struck a chord with Brampton residents, many of whom crowded into the City Hall Conservatory Thursday night to share their passionate support, concern, or deeply personal tales of how the drug has affected them, some for the better, others for the worse. The meeting, which was also viewed by nearly 200 people online, was punctuated by persistent shouting, arm waving, head shaking and tales of personal struggle, success and tragedy. Kidnapping, medical miracles, drug dealers dwelling in Brampton’s community parks, and Brampton’s vulnerable youth all came up in the discussion. “Are we going to put money over the life of our children?” one attendee exclaimed, turning to look at the crowd around her. The passion in the community is clear, the lines drawn in the sand are even clearer, and Brampton councillors are now in the sticky position of having to decide whether to open the city’s borders to private retailers, or put up metaphorical walls and play a game of wait-and-see. The province has not given municipalities a definite closing date for opting back in if they initially choose to pass on allowing one of the first 25 stores licensed to settle here. Council will make its final decision in a special meeting Jan. 21, one day ahead of the province’s Jan. 22 deadline to opt out. The town hall meeting made it abundantly clear that there is a lot for members of council to consider. On the surface, many in the opt-in camp point to the tax revenue and provincial assistance the city would gain by allowing the stores. Scheduled to start flowing this month from the provincial government, $15 million will be split among all municipalities in Ontario, based on population, to deal with the initial impacts of cannabis legalization. Following that, an additional $15 million will be split among those municipalities who choose to opt-in to the provincial retail model. “We cannot afford to miss out on this lucrative system,” said Everton Dwight Campbell, a Brampton resident and former candidate for regional council. The provincial funding can be used by municipalities to counter impacts of legalization, whether under regulations or through bylaw enforcement. The problem is, the effects of welcoming retail cannabis stores are unknown at this point. Though recreational cannabis has officially been legal since Oct. 17, Joseph Pittari, Brampton’s acting CAO, says the city has not seen a big influx of calls in relation to the drug. In total, 19 calls have come in regarding cannabis, the majority of them asking where it can be purchased and smoked. 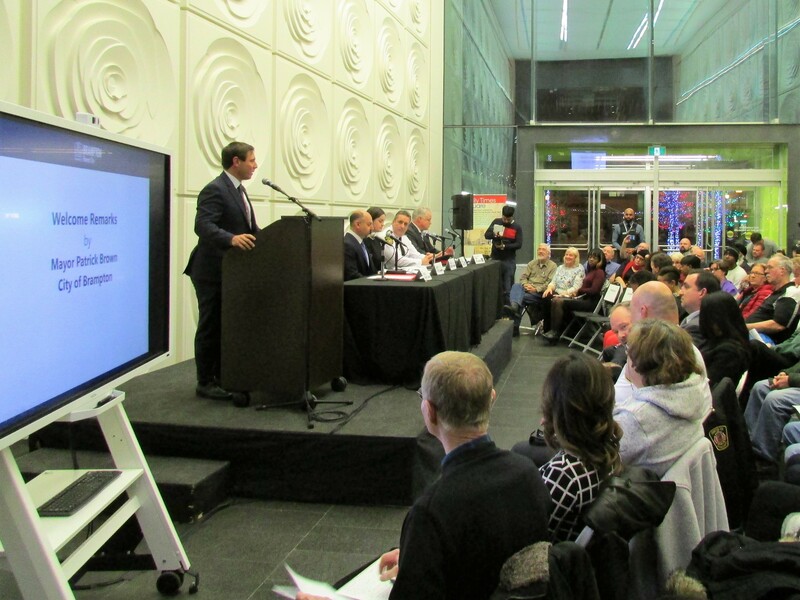 The funding has consistently been a sticking point for Mayor Patrick Brown, who reiterated his campaign mantra that the amounts offered to deal with cannabis represent just another instance of Brampton not getting its fair share. Mayor Patrick Brown speaking at the town hall meeting. An initial analysis done by the Federation of Canadian Municipalities in 2017 found that per 500,000 population, municipalities could expect administration costs ranging from $750,000 to $1.5 million. The relatively paltry funding the province has offered provided ammunition for the opt-out camp, who seized on the idea that no amount of money now would be able to counter the negative impacts on the city’s youth and the potential health effects in the future. Dr. Kate Bingham, an associate medical officer of health for Peel Region, who was in attendance at the meeting, attempted to clear the air ahead of the public forum. Speaking about recreational cannabis use alone, as opposed to medicinal cannabis used to treat a chronic condition, she said use by youth in particular can potentially have negative side effects. According to Peel Region data, 8 percent of residents surveyed over the age of 12 reported using cannabis over the past 12 months. Among students in Grades 7 to 12, that percentage increases to 16 percent, use typically rising with age. Approximately 23 percent of those students reported being worried about their cannabis use. It was this number that Bingham says most interests her. “Regular use … from a health standpoint, I think is the most concerning,” she said, pointing to the potential impacts of cannabis on the developing brain. However, many in attendance championed the flip side of cannabis: its apparent medical benefits. Anne-Marie Carreiro, diagnosed with a brain tumour in 2012, began using cannabis oil as a treatment in 2014. After three years of use, she says, doctors were able to completely remove the cancer, which was initially thought to be inoperable. While urging those in attendance to support the opt-in option, she also pushed them to get educated on the truth about cannabis before making a decision. “Please, please, don’t just say no, get educated—and that’s one thing that I’m hoping council will do from this point forward,” she said. Most of Brampton council was present at the event. Brown, sitting with the panel at the front of the city hall conservatory, was joined by Councillors Rowena Santos, Paul Vicente, Jeff Bowman, Pat Fortini and Charmaine Williams, who sat with residents in the crowd. The spectre of rising crime was also raised at several points during the meeting. 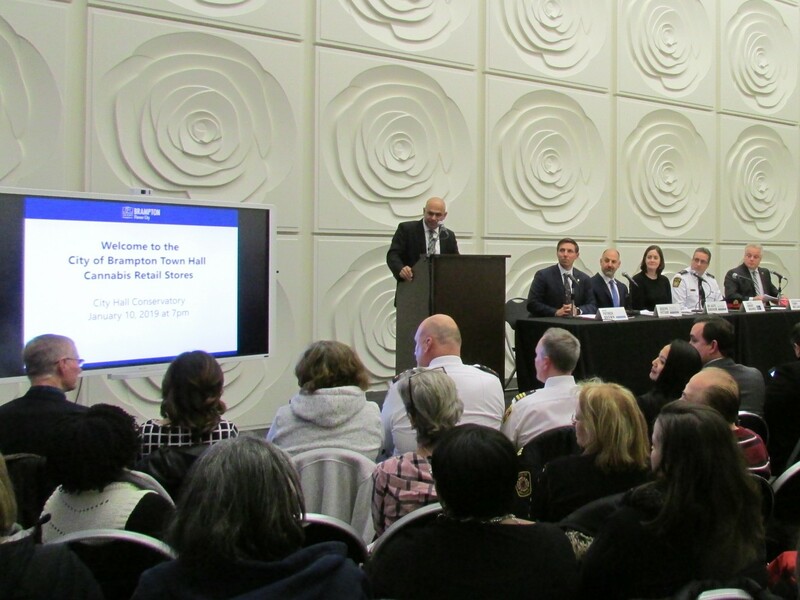 Both sides of the debate seized on the potential impacts of cannabis retail stores on the criminal element in the city, with opinions split on whether these stores would help to reduce black-market sales or simply be another avenue for youth to obtain the drug. Those on the opt-in side said legal stores would eliminate the need for black-market dealers, and, thanks to strict regulations they must follow, would help to keep the drug out of the hands of youth. The discussion will be a lot to process for councillors, many of whom have yet to take a public stance on the issue. The one councillor who has is Charmaine Williams, who made it a campaign plank to fight the presence of these stores in Brampton. If council says yes, the number of stores Brampton will actually get, if any, remains to be seen. In December, the provincial government, citing a nationwide cannabis shortage, announced it would limit the number of cannabis retail licenses in Ontario to 25 for 2019. Toronto has been allotted five licenses, while the GTA (York, Peel, Durham and Halton regions) in total is to get six. A lottery, being held today, will decide which retailers will be allowed to open stores in each region. The exact location is up to the winning retailers, many of whom will probably wait to choose until after Jan. 22, when the list of municipalities open for this kind of business is finalized. 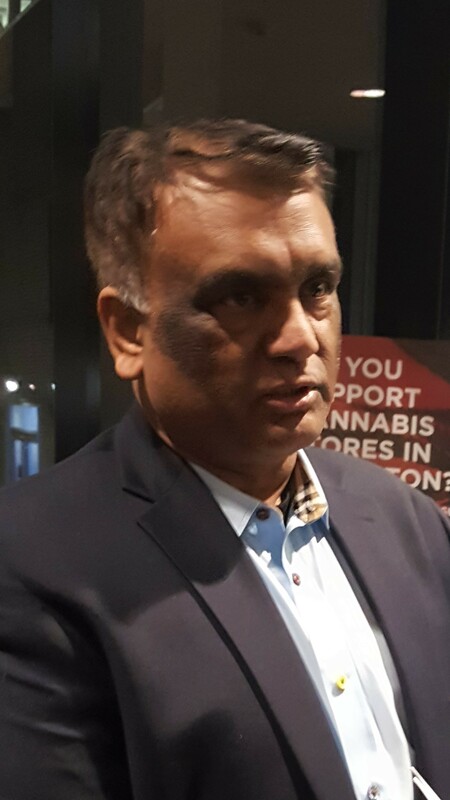 Peeyush Gupta, owner of The Wee Smoke Shop in downtown Brampton, a head shop that sells bongs, papers, e-cigarettes, cigars and other cannabis and smoking paraphernalia, was in attendance and shared his disdain for the lottery process. He decided to not apply for a licence in the initial phase. The decision to limit licences has become controversial in itself, with the federal government denying the claims of a cannabis shortage made by Ontario Attorney General Caroline Mulroney and Finance Minister Vic Fedeli. Regardless of the future number of stores, council will need to come to a consensus on Jan. 21. An earlier staff recommendation, received by council in December, already urged council to opt-in, citing an Environics survey of 910 residents showed 54 percent of respondents sampled “strongly” or “somewhat” support pot shops in Brampton, while 40 percent “strongly” or “somewhat” oppose them. Only 6 percent of survey respondents were undecided. Councillors dismissed that recommendation and opted to hold off, so as to gather further input from residents. 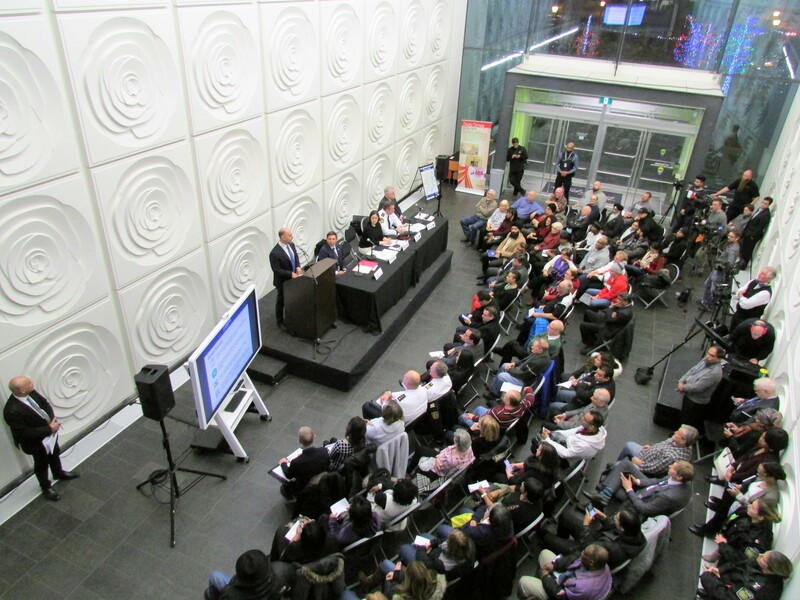 The result was Thursday’s town hall meeting, along with further online consultations and in-person surveys held over the past week at community and recreation centres across Brampton. “We’re a stronger city when the community is involved,” Brown said. The special meeting to decide the future of cannabis in the city begins at 7 p.m. Jan. 21, at city hall.